Visual field testing is useful for determining lesions of the visual pathway. Many techniques are used for this purpose. The examiner should learn to perform the technique known as confrontation visual field testing. In this technique, the examiner compares his or her peripheral vision with that of the patient. The examiner stands or sits 3 feet in front of and at eye level with the patient. The patient is asked to close the right eye while the examiner closes his or her own left eye, each fixating on the other's nose. The examiner holds up fists with the palms facing him or her. The examiner then shows one or two fingers on each hand simultaneously and asks the patient how many fingers he or she sees. The hands are moved from the upper to the lower quadrants, and the examination is repeated. The examination is then repeated, with the other eye of the patient and that of examiner. 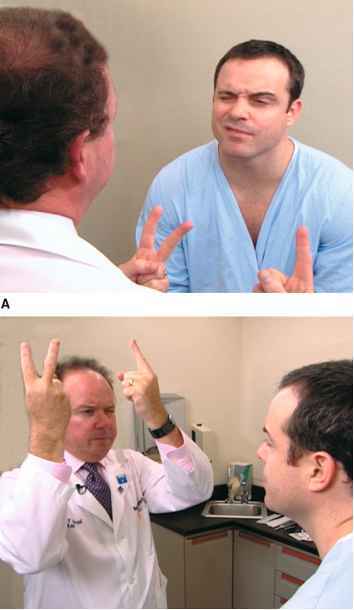 The fingers should be seen by both patient and examiner simultaneously. To position the patient to better advantage, the hands are held up slightly closer to the examiner. 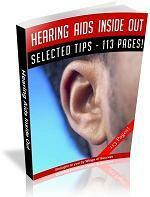 This provides a wider field for the patient. 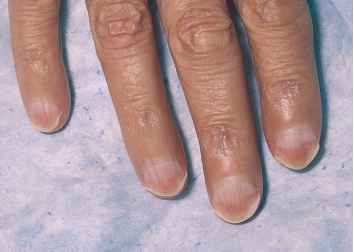 If the examiner can see the fingers, the patient can see them unless he or she has a field deficit. This technique for examining the patient's left eye is shown in Figure 10-10. Because lesions along the visual pathway develop insidiously, the patient may not be aware of any changes in visual fields until late in the course of the disease. Confrontation fields, performed by the internist, may provide the first objective evidence that the patient has a lesion involving the visual pathway. An area of depressed vision is called a scotoma. The normal central vision extends approximately 30° in all directions of central fixation. The blind spot is the physiologic scotoma located about 15° to 20° temporal to central fixation, corresponding to the optic nerve head. No sensory elements such as the rods or cones are located on the nerve head. Pathologic scotomata may be appreciated on visual field testing. Scotomata may result from primary ocular disease, such as glaucoma, or from lesions in the central nervous system, such as tumors. Figure 10-11 illustrates some of the common defects. Total loss of vision in one eye constitutes a blind eye, resulting from a disease of the eye or a lesion of its optic nerve. Hemianopsia refers to absence of half of a visual field. A defect in both temporal fields is termed bitemporal hemianopsia. It results from a lesion involving the optic nerves at the level of the optic chiasm. Pituitary tumors are common causes. A homonymous hemianopsia results from damage to the optic tract, optic radiation, or occipital cortex. The term homonymous indicates that the visual loss is in similar fields. A patient with a left homonymous hemianopsia is unable to see the left half of the fields of both eyes. This defect occurs with damage to the right optic tract. Homonymous hemianopsia is the most common form of field loss and occurs frequently in patients with strokes. A quadrantanopsia is a field loss in one quadrant. A patient with a left upper homonymous quadrantanopsia has damage to the right lower optic radiations or the right lower occipital region. Tunnel vision may occur in advanced glaucoma. However, the visual fields enlarge with increasing testing distance, in contrast to hysterical blindness, in which the field size typically remains the same at all times. On occasion, a patient with psychiatric problems may feign blindness. A useful test for ruling out such malingering involves optokinetic nystagmus (OKN). OKN is the rapid alternating motion of the eyes that occurs when the eyes try to fixate on a moving target. For example, observe the eyes of a person riding a train as it enters the station. The eyes move rapidly back and forth as the person tries to fixate on a station sign. The presence of OKN indicates physiologic continuity of the optic pathways from the retina to the occipital cortex. Figure 10-10 Confrontation visual field testing. A, View of the patient during examination of the lower fields of the patient's left eye. B, Position of the examiner during examination of the upper fields of the patient's left eye.